Topic for Jan 20 – Jan 26: Why is this important to you? Why are you interested in reading Vintage SciFi? What do you get out of it? With so many new books coming out every year, why even bother reading older science fiction? Is there value in reading older science fiction? Is it worth your time? Why even read this stuff? Ok, that’s my two cents. 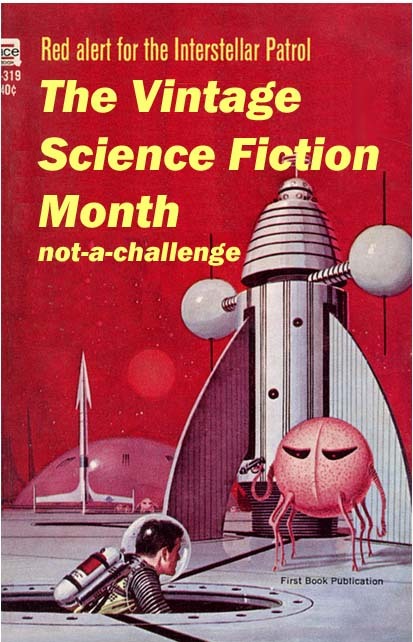 20 Responses to "#VintageSciFiMonth Discussion: Why Even Read This Stuff?" “Book parents” — that’s a great way to describe it. I read Philip Jose Farmer’s World of Tiers mostly because I wanted to know about the “book parents” of one of my favorite series. I liked Starship Troopers a bit better once I knew it was a “book parent” of John Steakley’s novel Armor… and that E. E. “Doc” Smith’s Lensman stories were a “book parent” of Heinlein’s novel. I enjoy tracing books’ “lineages,” although some seem to have been engineered out of so many different sources of inspiration that it’s not easy to find ’em all. aren’t book lineages just the neatest thing? When i’m reading interviews with authors, or a biography of that author, I am always scanning for the books they read as a young person that inspired their ideas, and authors who they tried to emulate. I won’t have time to read any vintage sci-fi this year due to previous commitments, but I have added your blog to my RSS feed and will participate next year. This is such a cool idea. Thank you very much for starting it. Hey, I’m an old guy. I started reading science fiction in 1953, when I was eight years old, so of course I read what was there, in the magazines, mostly Astounding Science Fiction and Fantasy and Science Fiction but also If and <i.Amazing. Plus there were the paperbacks at the bookstore, early Arthur C. Clarke, Issac Asimov, Robert Heinlein and all the rest. So what you refer to as “old” and “vintage” is just what I grew up reading. So what you think of as history was just my early years and teenage years. I read science fiction because I have always read it, starting with the Winston Science Fiction series. (Winston Science Fiction was a series of 37 American juvenile science fiction books published by the John C. Winston Company of Philadelphia from 1952 to 1960). I got them at the library and loved them. We started reading scifi at the same age, I was around 8 too. But for readers of my generation, or even younger than me, there’s got to be value in us reading the science fiction that you grew up on, right? Absolutely. Enjoying the books and stories for themselves, of course, but also understanding the roots of the genre, and the kinds of subjects and plots that authors were writing. It’s also important to realize that writing was a market, writers making a living writing what the editors thought would sell. So reading “old” SF gives insight to what readers wanted. I read and review both old and new titles. I’m 68 but didn’t get into SF until I was about 17-18, senior in high school. I’ve enjoyed a lot of the Golden Age, some not as much, read a lot of the New Wave and after. The past few years I’ve been going through all the Hugo & Nebula winners, with my last classic read being Slan, which won the Retro Hugo in 2016. It didn’t age well. I’m starting to wonder how I will react now to things I liked back in the late 60s-early 70s. The two I have on my list for next month are Pohl’s Man Plus and Gateway. I do think it’s important, especially for writers, to know how the various themes and tropes were handled by earlier authors, but I sincerely think the genre is in better hands today. We are in the Platinum Age. Have you seen the volume of essays that Jo Walton did? She did a short essay at Tor.com for nearly every year of the Hugo’s, where she talks about the ballot and her thoughts on the titles she has read, it’s called An Informal History of the Hugos. If you are working your way through the Hugo’s, you might like her book, or at least some of the original essays at Tor.com. I probably read a few of those articles, but don’t have the book yet. I do have “What Makes This Book So Great” but haven’t read all of it yet. I agree that Van Vogt has not aged well. For me it may be as simple as, there is nothing quite like it. A big part of it is the nostalgia factor. There is newer science fiction that has certainly excited me, don’t get me wrong, but more and more I find myself less interested in recent novels that, at least on the surface, appear to be pushing some agenda or trying to reinvent the narrative process. Now to be fair, much of the old stuff I like reading was probably doing the same thing when it was being written and published. But the reality is that I have enough of…reality…in keeping a reasonable idea on what is going on in the world and thus I’m less interested in examining current social and political issues through the lens of science fiction than I am in the buzz I get from the context and stories that were written 30 years and more ago. There is something historical/nostalgic there that gets me in the feels in a very different way than even the best current fiction does. That doesn’t make one or the other better or worse. It just makes them different. And I find that even if I only read vintage SF during certain times of the year, my engagement in reading and the overall feeling I get about the process of reading is ultimately richer when I’m reading good (to me) older science fiction. The way it takes me back to my own childhood obsession with reading and dreaming about what our future might look like, despite the fact that it is nothing like I had hoped, is a huge draw that I don’t get from modern SF. Or at least most modern SF. I’m currently reading Harry Harrison’s memoir and it reminds me of how much older fiction has had an impact on my since my very early reading days and I like being able to examine what the world was like then through the eyes of the authors who were living in the 40’s through 70’s. There is something special about it that I cannot quite put my finger on, despite all these many words. And in this week, which will soon mark the 2nd anniversary of the death of the one personal, in my neighborhood, friend who lived and breathed classic SF, I am feeling even more love for these works of literature than I ever have before. Carl!! So great to hear from you, my friend! i think you hit it on the head with ” I like being able to examine what the world was like then through the eyes of the authors who were living in the 40’s through 70’s. ” because that is exactly it – we are seeing the world through that author’s eyes. What gave them a sense of wonder? what were they reacting to? what were they satirizing? i am so sorry to hear of the anniversary of the passing of your friend. May this week be peaceful for you. I appreciate that, I really do. I just spent some time breathing life into my neglected blog and a post will go up tomorrow in honor of his memory. And even though I have not “officially” signed up, I have been well aware of what this month is and have been dipping into some great classic science fiction. Vintage SF as history lesson makes a lot of sense to me. I like getting to know what people thought about in the past, and vintage SF is a super-fun way to do that! On the whole, I like reading old things. There’s also the bonus of the cover art, which I adore. if you adore vintage cover art, you’re going to LOVE next week’s vintage scifi discussion! One other thing I like about older sci-fi and fantasy (outside of my general love of all things pulpy) is format/length. It was a lot more common in years past to have books around 150-200 pages, versus the 500+ page doorstoppers that are currently popular. And while I appreciate being able to spend more time with a world and its characters, the older I get and busier I am in my career, the more I want a book that I can read and digest in a spare evening and that doesn’t feel like I’m making a major commitment when I start it. I can sit down, explore other worlds, get invested in characters, but even if I find that I can’t put the book down I can still go to bed at a reasonable hour. the 200 page novels of old are THE BEST. Novellas are my favorite thing now. I can get through the entire thing in an evening. I’m one of those “parents” who started reading SF in the early 1960’s. I still have most of the books I read back then on my shelf, including the one you’re using for the illustration. (Crashing Suns) However, with a few exceptions, I simply can’t go back and enjoy them again. Perhaps I no longer have the youthful sense of make believe needed to fill those now rather sparse and hurried stories with the sense of wonder they once inspired. Or perhaps I just want something different, something more, in a story than I did back when I was 14.